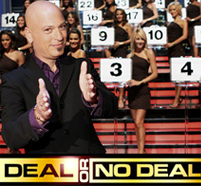 DATV became part of a Hollywood sound stage as it hosted a live feed for NBC’s hit game show “Deal or No Deal”. The segment was taped in DATV’s studio on August 1st and is scheduled to air on WDTN-TV on Friday, November 21st at 8:00pm. Dayton resident Devon Clark was chosen as a contestant on “Deal or No Deal” and he selected his grandmother Margaret Rice as one of his friends to help him on the show. Ms. Rice was unable to fly to Los Angeles for the taping so Lock and Key Productions, the production company that produces “Deal or No Deal”, contacted DATV to host a live segment. Ms. Rice was set-up in the studio with a two-way live feed to Los Angeles. During the taping she was able to watch the production on a monitor and interact with the program when the time was right. DATV cannot report how much Clark won so be sure to watch his appearance on “Deal or No Deal” on WDTN to find out how it turned out. This entry was posted on Wednesday, November 19th, 2008 at 2:50 pm	and is filed under Film Dayton. You can follow any responses to this entry through the RSS 2.0 feed.